Since May, Miller Hall — one of Tufts’ 11 residence halls that house first-years — has been undergoing massive construction. According to the university’s Operations Division website, Miller is being renovated to have new elevators, accessible common spaces and safety code upgrades, among other improvements. Construction on Miller Hall is slated to be complete in December, though students are currently living in its east wing, which was renovated over the summer. After Miller is fully renovated, current residents of Houston Hall’s east wing will move to Miller’s west wing for the second semester. Houston will then undergo construction and be fully renovated by August 2019. Joshua Hartman, director of the Office of Residential Life and Learning (ORLL), is optimistic that the renovations to Miller Hall will create a more inviting atmosphere for residents. Hartman noted that since Miller Hall was built in 1959, its appearance was darker and more old-fashioned compared to many of Tufts’ newer residence halls. Aesthetically, Miller was in need of a brighter appearance, according to Hartman. While students living in both Miller and Houston Halls are looking forward to the new amenities, some Miller residents feel that the renovations have had a negative impact on their first semester at Tufts. Residents have been forced to deal with loud morning construction and a dearth of common rooms. Rachel Wang, a first-year Miller resident, explained that while she is looking forward to the new additions, construction work has often hindered her daily routine. Hartman explained that efforts to reduce construction noise in the morning have minimized disturbances, as compared to the beginning of the semester. In addition to shifting the times at which heavy construction occurs, ORLL has made efforts to foster social life in the residence halls. To make up for Miller Hall’s current lack of a common room, Hartman explained that temporary spaces have been created for first-year students to socialize. 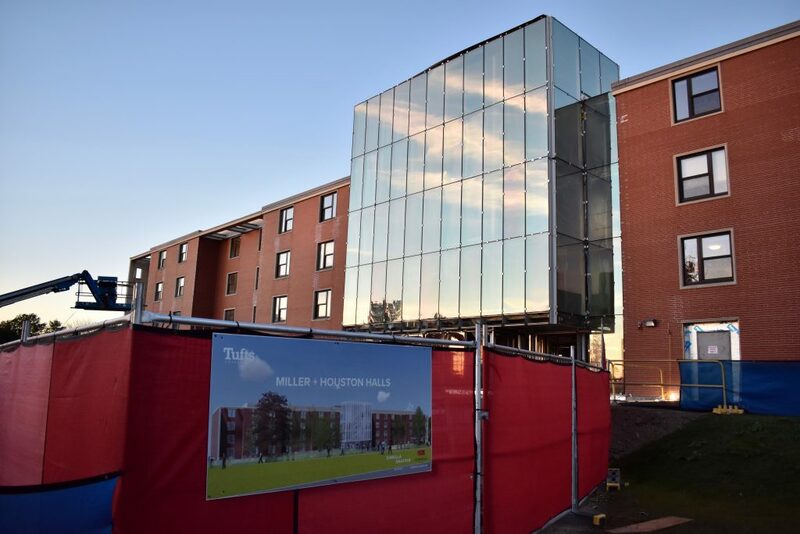 As construction on Houston Hall will begin promptly after Miller is finished, many Houston residents will move to Miller for the spring semester. According to the university’s Student Life website, a professional moving team will transfer students’ belongings transferred between the dorms at the end of the fall semester. Information sessions about the moving process will be held throughout the fall semester. Many current Houston residents are excited for the move, since it will presents an opportunity to meet new people and take advantage of Miller Hall’s new amenities. Logan Herodes, a first-year assistant in Houston Hall, believes the change will be a positive experience. “I think it’s going to be fun to experience another building with updated features and get a chance to reinvent our rooms as we unpack again,” Herodes, a junior, said. However, moving into the newly renovated Miller Hall also poses challenges for students. Sarah Unterberger, a first-year Houston resident, is excited to move into the renovated dorm but worries that it will be difficult to adjust to a new environment. While the process of renovating Miller and Houston halls has sparked mixed feelings among the student body and has proved difficult to adjust to, Wang believes that the upgrades will ultimately have a positive impact on first-year residential life.